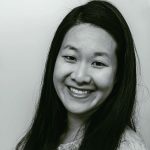 Published Aug 7, 2018 By Julia 4 CommentsThis post may contain affiliate links. 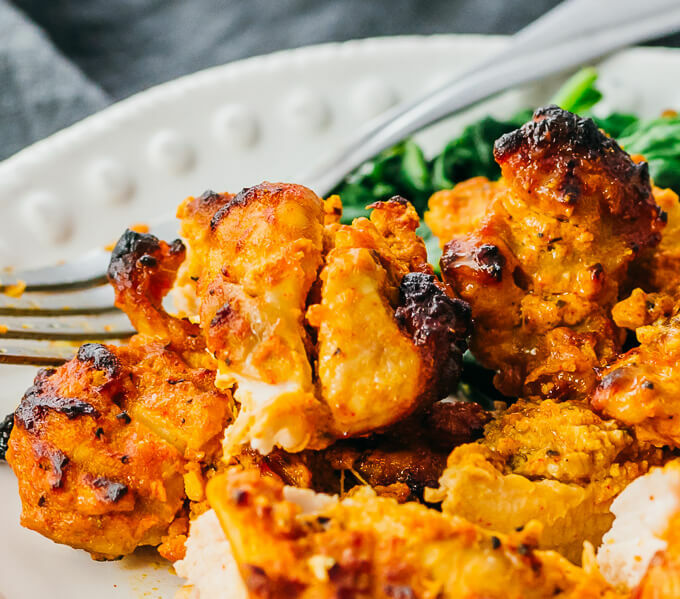 Tandoori chicken is an Indian dish originating from the Punjab region and traditionally made in a tandoor, which is a tall cylindrical clay oven. Heat is generated using a wood or charcoal fire inside the tandoor itself, so the food is cooked with both radiant and convective heat. 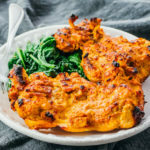 Outside of Asia, tandoori chicken is typically cooked on a grill or in the oven; I find it easiest to use the oven on the broiler setting, which produces delicious results. 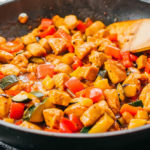 This chicken dish is known for its vibrant red, orange, and yellow hues. 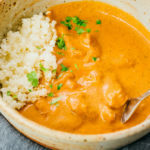 This is due to the spices used in the yogurt marinade: cayenne and paprika add a touch of reddish orange, and turmeric has a distinctive yellow. 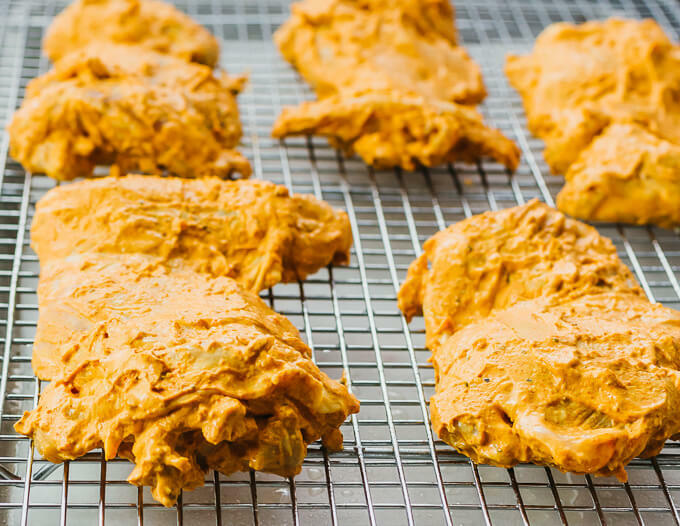 The chicken’s resulting texture is crisp, as the marinade coating the chicken dries out as it cooks. There are also delicious blackened bits on the corners of the chicken pieces — the best parts! Overall, the chicken is very flavorful, thanks to the generous amount of spices. 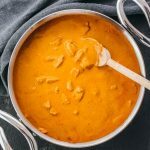 The marinade is a thick yogurt mixture filled with aromatic spices like cumin, paprika, and turmeric, reminding me of a chicken tikka masala marinade. The large quantity of seasonings — sometimes up to a tablespoon of a particular spice — aren’t a typo! 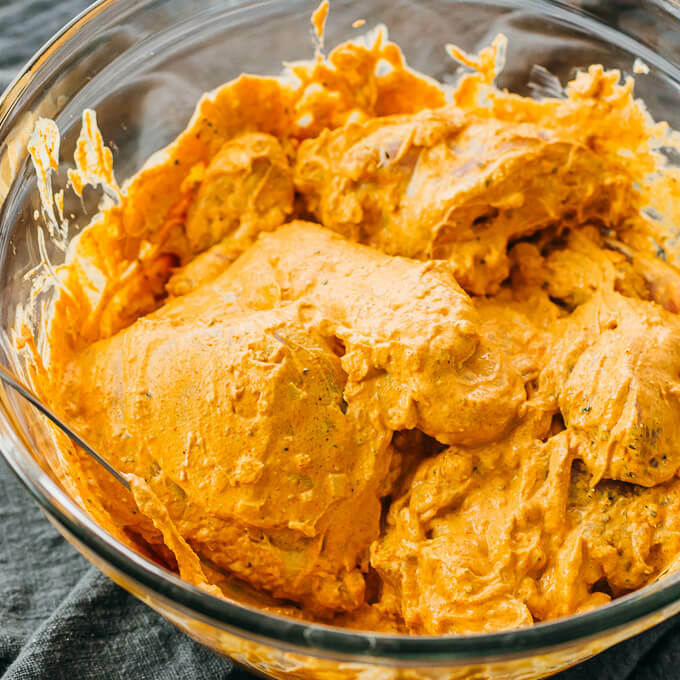 You really do need all of those spices to create an authentic- tasting tandoori chicken. I recommend marinating for 24 hours, if possible. 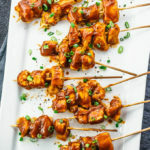 You can prepare the marinade the night before, and let the chicken marinate in the refrigerator until you’re ready to cook it the next day. You can broil the chicken directly on a baking pan, or on a wire rack fitted atop the baking pan. I’ve done it both ways, and the results are pretty similar. With a wire rack, the chicken juices fall through so the chicken isn’t sitting in a puddle, but it also results in some indentations on the chicken and more cleanup work. Broiler settings can vary substantially from oven to oven. 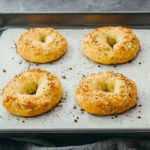 They will vary in their heat distribution and intensity, and so cooking times listed in the recipe are simply estimates. It’s best not to rely on time estimates while cooking; it’s always better to use visual indicators to determine when something is done. Keep a close watch on the chicken, monitoring every few minutes and then more frequently when it’s almost done. It always pays to be vigilant when the broiler is running, as things can burn quickly! You’ll know the chicken is done on each side when it appears crisp, like the marinade has been baked into the chicken. You should also be getting some nice charred and blackened bits on parts of the chicken. 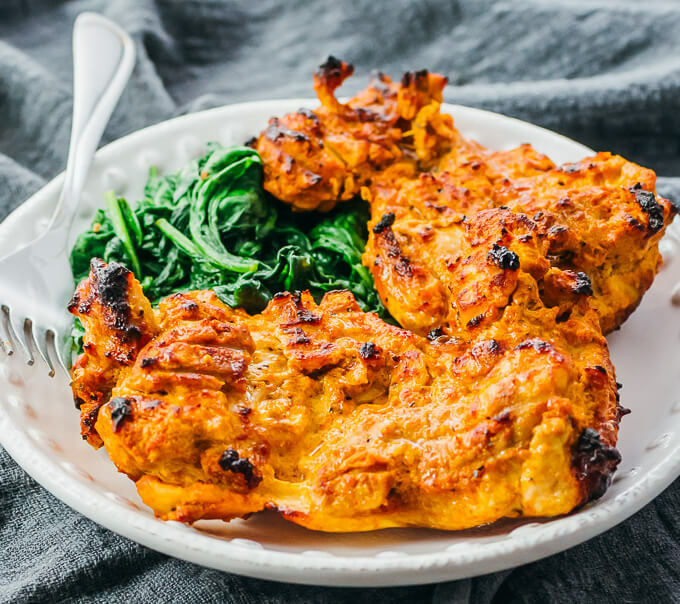 Tandoori chicken is very flavorful, so it’s well-complemented by something mild, like a small serving of sauteed spinach, about 2 ounces per person. Sometimes I make plain spinach using only olive oil, salt, and pepper; other times I change it up by adding chopped garlic or red pepper flakes. You can saute the spinach while waiting for the chicken to broil. I use fresh baby spinach leaves and add them to a medium-sized pot over medium heat. Stir them until wilted, or cover with a lid to encourage steaming so that they wilt faster. Stir in seasonings and keep warm on low heat until the chicken is done. 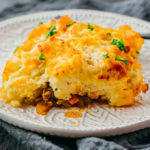 Other great ideas for vegetable-filled side dishes include creamed spinach, sauteed asparagus, pressure cooked green beans, and mashed cauliflower. Enjoy! 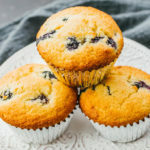 Great recipe, but not everyone has an oven with a ‘broiler’ (a grill in the UK). I ended up cooking in the oven and then grilling to blacken up the chicken, which is probably not quite the same but at least I could give it a go! Hi Jane. An oven with broiler setting is standard in the U.S., but I certainly cannot speak for my non-American readers, so thank you for the feedback! If I didn’t have a broiler, I would either grill this, or bake at 450 F and skip the grilling part. Great, let me know how it goes if you try this recipe!